"Odoriko Kagura" meaning "The Dancer Kagura"
Harrys: Introducing first from Ise, Mie, Japan weighing 145 pounds, Kagura Ohzora! 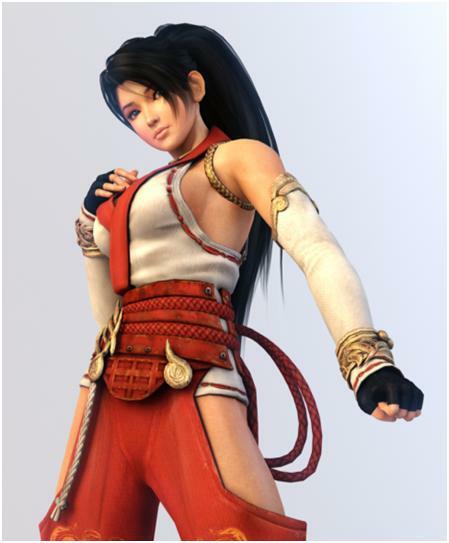 Harrys: And the challenger from Ise, Mie, Japan weighing 145 pounds, Kagura Ohzora! Harrys: Making her way to the ring from Ise, Mie, Japan weighing 145 pounds Kagura Ohzora! Hair: Long and black. When in the ring she wears it pulled back. Primary backstage attire: She normally will wear casual western style clothing. Secondary backstage attire: Traditional shrine maiden attire; a pair of red divided trousers called a "hakama" and a white kimono shirt called a "haori." She also wears Shinto prayer beads as a necklace. She can often be seen carrying paper charms called an "ofuda." Primary ring attire: A variation on the traditional shrine maiden attire. A short sleeved white top with red trim. White sleeves going up her arms. Red pants are secured to her waist wrapped with a red belt. She wears black boots. Secondary Ring attire: She only wears the solid black color scheme when wrestling as Youkai Kagura. Physical features: Fair skinned. No noticeable scars. Physically fit and athletically toned. 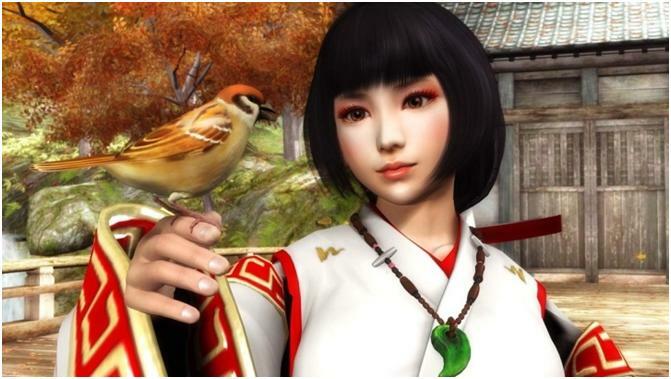 Kagura has a radiating beauty and feminine charm that is said to be inescapable. Kagura likes to wear light dark eye liner around her eyes to give herself a slightly more intimidating look. 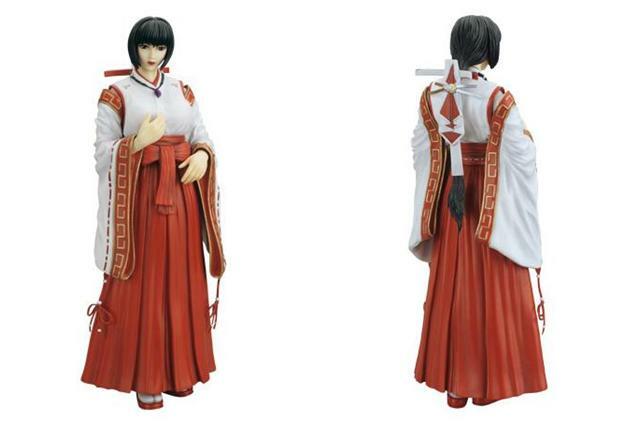 Kagura Ohzora is a Shinto shrine maiden and priestess. Pros: She is an explosive competitor and can strike without warning. She has great in ring presence. She is quite fast and agile. Her reflexes are cat like. Despite her appearance her pain tolerance is very high. Cons: Suffered from asthma as a child, and as a result her stamina begins to steadily drop over time. Despite being very athletic, she hardly ever uses high risk maneuvers. Due to her competitiveness, she can become overeager and impatient, and that can cause her make mistakes. While she can understand English and write it, she rarely, if ever, speaks it. Face, but isn't above breaking the rules for her own personal gain. Kagura was born in Ise, or the city more commonly known in Japan as the "Holy City," where she lived for the majority of her life. The city is named after the famed Ise Grand Shrine [Ise Jingu] - the most important Shinto shrine in the country. The Watarai clan is a family of priests and priestess that have been the keepers of the Ise Jingu outer shrine for centuries. Kagura grew up in the village surrounding the outer shrine. As a young miko, she was trained in the various duties of the miko: performing purification rituals, pyromancy, ceremonies, and various festive dances and musical instruments. During this time, she was trained in the art of judo by her overbearing grandfather. Her family did not have enough money to send her to college, and Kagura soon found herself in need of money following the ailments of her father. She entered the ranks of "joshi puroresu" because it was an easy way to make some fast cash. Following the next few years she quickly became a rising local star. Entire crowds flocked to see her perform. 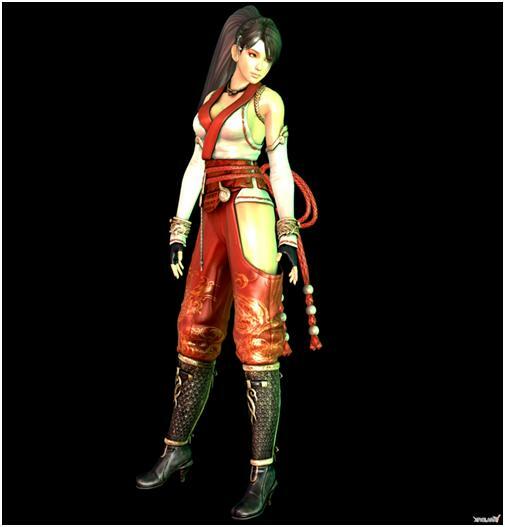 Her unique style allowed her to fuse her miko background with her martial arts training. As a result, her matches were more like stand alone works of art. Her movements were so fluid that it was almost as if she danced in the ring and subdued her opponents with rapid graceful motions, rather than relying on brute force. She briefly retired as a professional wrestler following the death of her father and devoted herself purely to the shrine, but was soon forced to return to the lifestyle as her grandfather became ill. The call from WZCW talent scouts eventually made its way to her ears as the monolithic American company began signing many noteworthy talents from the different promotions across the country. And soon enough she was offered a developmental contract through contacts from her former promotion. Even though she spoke little English and knew next to nothing except for the basics of American culture, the scouts praised her gorgeous looks and feminine charm. After weighing the pros and cons she finally decided that the opportunity was too good to pass up. Not wanting to leave her identity behind, Kagura decided to take it with her to America. Much of her recent WZCW history was tied to a book that she found in an airport, having been dropped by an anthropologist who was studying it. The book was claimed to have been cursed. The legend was that it was used to seal a vengeance demon during the Edo period. Sometime later a priestess attempted to purify the book, only to fall prey to the demon's influence. Possessed, she stole the souls of others, and sealed them away within the books pages. In the present day, a rogue sect of the Yakuza sought the book for their own gain. Kagura was attacked by the mobsters, but seemingly managed to gain control over the books power. Or so she thought. What followed was a two-year spiral as Kagura found herself struggling with depression, psychosis, anger, jealousy, injury, and drug use, as she tried to rediscover her own identity. Eventually she fell in love with the anthropologist, and it was thanks to his love that she was finally able to rid herself of that curse. The night she became Queen for a Day, she woke a primordial form of herself, which allowed her to go beyond her natural limits. She called this form "Youkai Kagura." She has yet to use this form in any match. The limitations of it are yet unknown. Kagura, once a shy, timid, and meek girl that felt out of place and in over her head in the world of WZCW, is now a hardened veteran. Her eyes display intensity, ferocity, and a lack of empathy that wasn't there before. She is a skilled judo practitioner, having been trained as a child, and can use a bit of jujitsu. 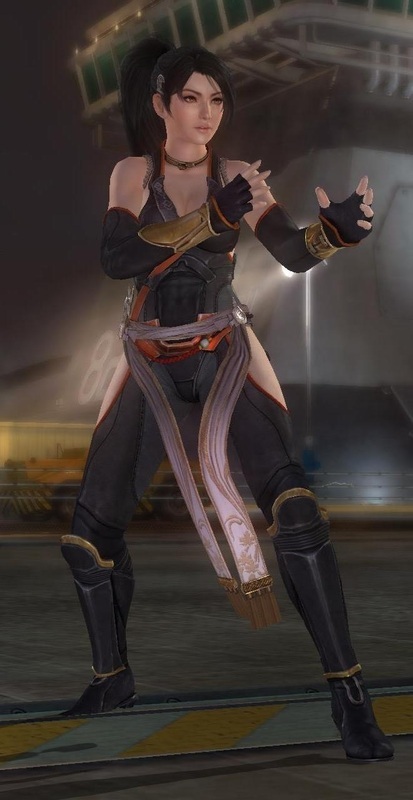 She mostly throws her opponent around, wearing them down with grappling holds before finishing them with a quick strike. She also practices "kyushojitsu," or pressure points. She knows enough of the basics in order to apply them both offensively and defensively. As her music plays pink lights begin to swirl around the stage in a circular pattern, representing the petals of many cherry blossoms falling through the air. A fine mist appears on the stage. She walks down the ramp through the mist, and ascends the stairs, entering between the middle ropes. Afterwards she bows to the side of the hard camera, and awaits her opponent. If her opponent is already in the ring, she'll either smile or sneer at them depending on their alignment. She'll then bow, respectfully if they are a face, or in mock fashion if they are a heel. Physical features: He is a middle aged gruff looking man. He has a light moustache and some stubble covering the rest of his face. He has short black hair. He is tall and well built despite his age. Backstage attire: He usually wears a white collared dress shirt with black dress pants, with a black leather jacket, belt, and shoes during interviews. Sometimes he will wear a suit. Almost always he can be seen smoking a cigarette. He keeps a lighter on his person. Occasionally he can be seen wearing sunglasses. Hair: Black. Cut moderately short and styled with the bangs covering his forehead. Tattoos: He has a tattoo of a tiger entwined with a dragon on his right shoulder. This is usually covered unless he is dressed casually. He is Kagura's former mentor and manager, but now he simply acts as her mouthpiece and official translator during backstage interviews and segments. Pros: He speaks fluent English as well as Japanese. He understands American culture, both past and present. He is charismatic and has a polarizing personality. His persona, coupled with his size and past skills as a wrestler in his younger days, makes him difficult to intimidate. Cons: Past injuries and advancing age make him less inclined to throw hands if confront backstage. He'll protect himself if attacked, though. 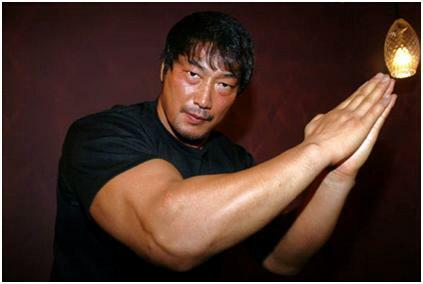 Gozaburo is a former bodybuilder and renowned pro wrestler who wrestled in Japan for many years. He moved to America in his early thirties and continued his career in the States, where he became further renowned. Unfortunately a myriad of injuries forced him into early retirement. When he retired he briefly became a high school professor teaching Japanese to English students. Soon thereafter he was once again bitten by the pro wrestling bug. Due to his advancing age and previous injuries he opted to take a position as a manager. What is the value of a person? By what merit is he defined? By the grace of the great ancestors a man was allowed to prosper. That man accomplished something so great that even foreign nations took note. And an opportunity was placed before him. 'Leave your home country for a chance to accomplish even more.' That opportunity had increased his merit; prosperity was now almost like a birthright. That prosperous man was once my grandfather. He taught me that the value of a person is weighed by the size of their heart. It was something that I had inherited from him and his great ancestors. And the same opportunities that were presented to him were now presented to me. But I am a coward. I am afraid of change. Great is the size of my heart, but small is my ambition. I needed a guide. I have been called an artist, a revolutionary, and even an ambassador. It is what I have come to embrace. Pro wrestling wasn't my first love. It was a craft I learned out of necessity for the sake of my family. I grew up in a small city and my family wasn't wealthy. We were considered important people by trade due to my grandfather's accomplishments. His was a trade that I had followed him into and I prayed that one day I could finally surpass him. That was my true ambition. Pro wrestling was merely something I did for extra money, but I was good at it. I trained for many years to hone my abilities, and wound up becoming a natural. Perhaps it was due to my background that I was able to connect with so many people. I enjoyed the fans and I drew so much strength from them. I eventually retired because wrestling wasn't my first love. But life erected obstacles in my path that forced me to make a decision, and that decision was to return to the ring. In a strange way I felt the craft ultimately chose me. And because of that feeling I have embraced this as a calling. Not my true one, but as something that I can be proud of to make my own. The room was dark and empty except for one light bulb in the center of the ceiling. It was cold and musty and looked quite run down. Everything was quiet until the sound of approaching footsteps began to echo through the adjacent hallway. A figure of a man appeared in the entry way. Even though he was middle aged it was obvious that he had kept himself in great shape. He was dressed in an expensive suit and was wearing a thick pair of shades that looked horribly out of place in the daftly dark room. He stretched out his hand and flipped the light switch with a wave of his hand. The bulb jumped to life with a flicker and began to buzz. It wasn't bright and only illuminated the center of the room. The man stepped forward and placed his hands in his pockets and pulled out a cigarette. He placed it in his mouth and pulled out a lighter. He flipped it open and lit the cig before taking a long drag. He blew a puff of smoke that settled into the air swirling around the light above him. "Age may have taken away my youth but in its place I gained wisdom. I was a professional wrestler once. I know how the industry is supposed to work. When I look at a company like Wrestlezone Championship Wrestling I see allot of young men. Those men are all just as hungry and as passionate about the business as I once was. But this enthusiasm has brought a dark cloud of gloom that has settled over the hearts of these men. So many of them are only out for themselves." He smirked and lets out another puff of his cigarette. "That's something that I can understand. When a man makes a decision to go out on his own he either takes his allies with him or he abandons them. The bonds I see between the men in this company are superficial. None of them have any shame or any humility. Pride is merely a representation of the ego, and as a man's ego grows the more isolated he becomes. These "bonds" between egos become chains, and the chains keep them confined within a "box" that no one else can enter." He began mimicking the shape of a square with his hand to emphasize his point as he spoke. Taking the cig out of his mouth he tapped it once as the ashes fell to the floor. "Back in the old days pro wrestling wasn't anything like the spectacle that it is now, but one thing has not changed. The energy of the fans still drives everyone with a heart for this industry to perform like they never have before. The energy and the passion will still drive every man and woman forward like it drove me many years ago. But when a man is living in a box that energy and passion is deflected because the fans cannot relate to the world inside that box. Because they too have an area that they are confined to and only the men bathing in that energy and passion are the heroes that fight for the people. The men and women who do not confine themselves inside a box..."
He began pacing ever so slightly. Each step seemed to emphasize his body language as he nailed his point home. "What this company needs more than anything else right now is a hero. The energy and passion that the fans have to give is being deflected by all these boxes that the stars of WZCW have confined themselves in to. No one is willing to reach outside of it. But soon that will change. The dawn of a new era is about to begin. A hero will appear soon to chase away these dark clouds and smash all these boxes that have been created by these selfish men so that the passion and the energy of the fans can reach everyone once again." He paused and looked up around the room. It was as if he could see his mental picture coming to life. "And I will be the one that will guide this hero so that another box cannot be created." He took the remainder of the cig and threw it on the floor. Instead of smothering the flame he turned to leave the room as dark and as dreary as it was before he entered. The lone flame of the dying cigarette became like a tiny match in the sea of darkness. And then it exploded, transforming into a much larger flame; the room transitioning into another. A figure, dressed in ceremonial robes, kneeled by the fire deep within mediation. "I understand what you say honored sensei; I have no desire to close myself inside of a box. But even so I do not want to be an artificial hero. I feel that heroes are predestined to be heroes. They are not made. I want the opportunity to walk my own path. I am honored to be given this opportunity. I will not waste it." Write whatever you desire WZCW superstars on a piece of paper and place it in a box. And pray that you are blessed before it is smashed.